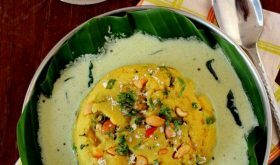 Broken wheat upma is the simplest South Indian breakfast one can ever make. It is my go-to breakfast when I am rushed for time and need a healthy yet filling meal to see me through the day. 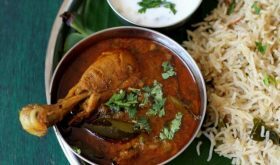 This fibre rich dish makes for a great evening tiffin or light dinner option when my fridge is almost empty (one of those rare occasions) :). In Andhra, we call finer version of broken wheat as godhuma nooka or samba rava and is popular among the Telugu speaking folks. It is called dalia in Hindi and godhumai ravai in Tamil. 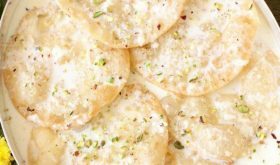 In our home, I usually use cracked wheat to make dalia khichdi, kheer, vegetable khara bath, godhuma rava tomato upma and other upma variations. Majority frown upon upma but I love it when served hot off the stove. 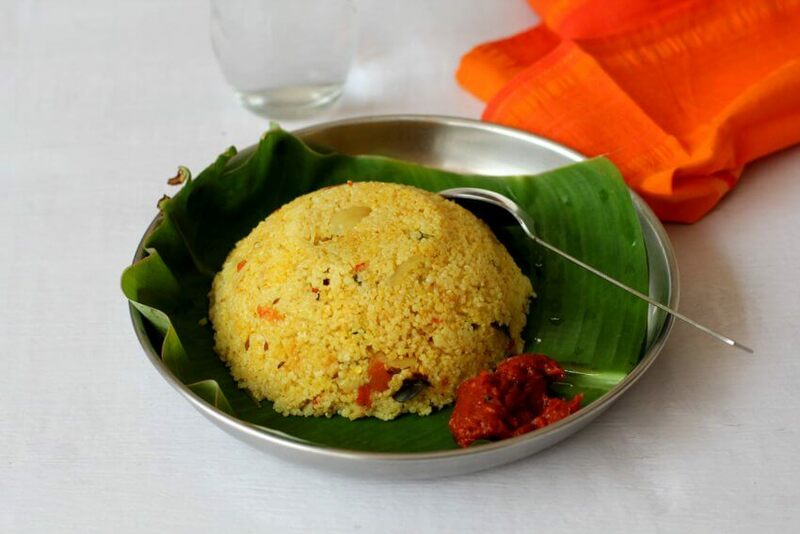 Broken wheat upma is super simple to make using minimal ingredients. I dry roast the cracked wheat in a little ghee, use cinnamon and cloves to flavour the upma and use a combination of ghee and oil for the tempering. These three steps are essential to enhance the flavor of the humble upma. I sometimes throw in a few chopped carrots and beans for added nutrition. 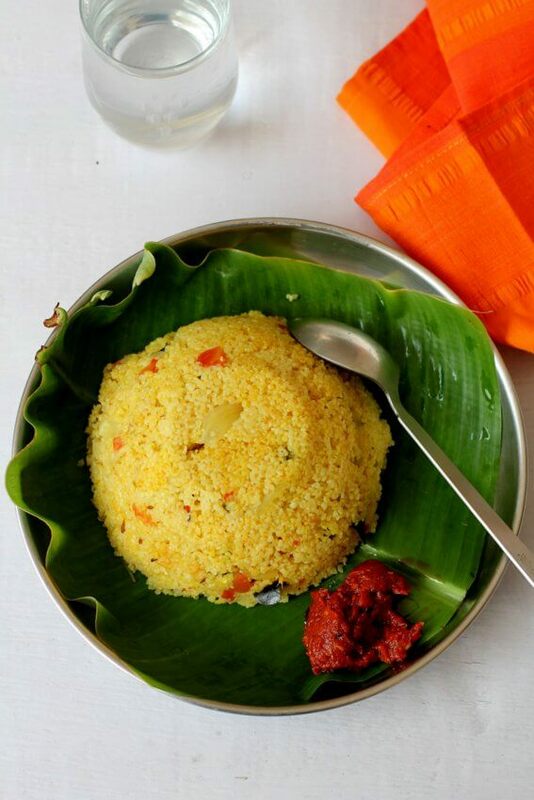 This diabetic friendly grain needs more water to cook than the normal semolina or upma rava. For one cup of finer version of broken wheat, you need to add two and quarter cups of water for the grain to cook well. 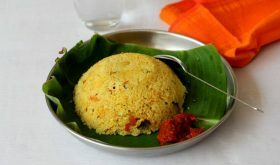 The resultant upma has a loose, dry texture. For a sticky, gooey upma, add 2 1/2 to 2 3/4 cups of water for 1 cup of broken wheat. You will find many Indian breakfast or tiffin varieties that are quick to make in the archives. Heat 1/2 tbsp ghee in a cooking vessel, add the broken wheat and toast it on low flame for 6-7 mins. Turn off heat and wash it thoroughly. Drain water and set aside. 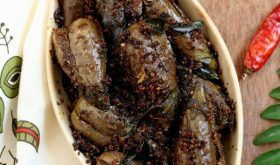 Heat the remaining oil and ghee in a cooking vessel, add the mustard seeds and allow to splutter. Add cumin seeds, cinnamon stick, cloves, asafoetida and curry leaves and saute them till a nice aroma emanates the kitchen. Add the chopped onions, green chilis, and ginger and saute for 4 min. Reduce heat and slowly add the cracked wheat to the water and stir it continuously so that lumps don’t form and it combines well with the water. Place lid and simmer for 20-22 mins or till the water is completely evaporated and the upma is done. Turn off heat and remove to a serving bowl. Garnish with coriander leaves if using and serve warm with pickle or chutney of your choice. You can add a fistful of chopped mixed vegetables like carrots, beans and peas. Add them after frying the onions. Saute for 4 mins and then add tomatoes. For a thick, sticky consistency upma, you can use 5 cups of water. If the broken wheat is not soft at the end of 25 mins, add a few more tbsps of hot water, cover, and simmer for a couple of mins. You can add few broken cashew nuts or peanuts at the time of tempering. Vegans can omit ghee and use coconut oil instead of ghee. It enhances the flavor of the upma. If the tomato is not sour, drizzle 2 tsp of lemon juice after turning off the heat. I am going to make organic broken wheat upma this Sunday. I thoroughly loved the recipe. 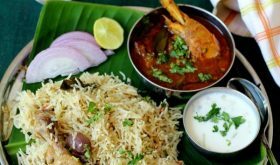 Cooking delicious dishes at home is easy with help of cooking recipes that are easily obtainable at various websites easily. Wow!! I really loved this recipe!! It’s so simple and beautiful, and that home-cooked feel is just what I needed!! Will surely try this recipe soon! !